If your mouth is a little tender or sore after wisdom teeth extractions, that’s nothing to worry about. In rare cases, however, patients experience significant pain at the surgical site due to a condition known as dry socket. What exactly is dry socket, and how can you cope with it? Let’s talk about these important questions. Visit Your Dentist in Enfield Before Your 2018 Insurance Expires! 2018 flew by, didn’t it? In just a couple of months, you’ll be putting up your new calendar, making resolutions for 2019, and looking forward to all the adventures of the new year. But before the curtain closes on 2018, it would be wise for you to schedule an appointment with your dentist in Enfield. Doing so will help you make sure that your dental insurance doesn’t go to waste. Comments Off on Visit Your Dentist in Enfield Before Your 2018 Insurance Expires! 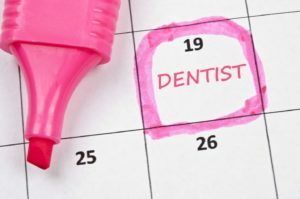 Busyness is a fact of life, so if you need to have oral surgery in Enfield, you might hesitate to make room in your schedule for a separate consultation appointment. You may wonder why you can’t just schedule your surgery, review some simple pre-op instructions, and jump right into your procedure. However, a consultation is always a good idea before any major oral surgery. 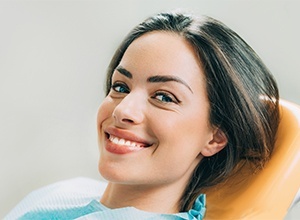 Let’s discuss some of the things that you and your dentist can accomplish at this important appointment. A dental emergency can afflict anyone, regardless of your age, gender, or oral hygiene habits. One moment, you might think your teeth are perfectly healthy, and the next, you could be in immense pain. 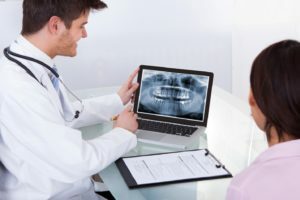 But is the situation a true dental emergency that requires professional attention, or should you just manage your symptoms at home and hope that you can avoid a trip to your dentist’s office? Here are some significant indicators that you should contact your emergency dentist in Enfield as soon as possible. 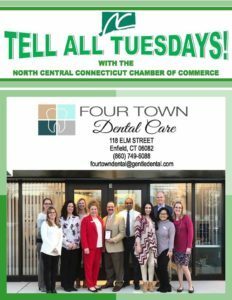 Here at Four Town Dental, we’re proud to be ardent supporters of our community and the North Central Connecticut Chamber of Commerce. Naturally, we were delighted when earlier this month, the NCCCC featured us in their Tell All Tuesday article. It was a fantastic opportunity for us to tell folks in our area all about your dentist in Enfield. Here is a summary of the article’s contents.